A note from Kim on cedar plank grilling: you can purchase cedar planks at your local grocery or foodie-type store, but they can be a bit pricey. Since the planks are not really re-useable, you can also purchase less expensive cedar from the lumber store. If you do, it is very important that you purchase untreated cedar. And remember, use this guide to buy the freshest wild-caught salmon available in your area. 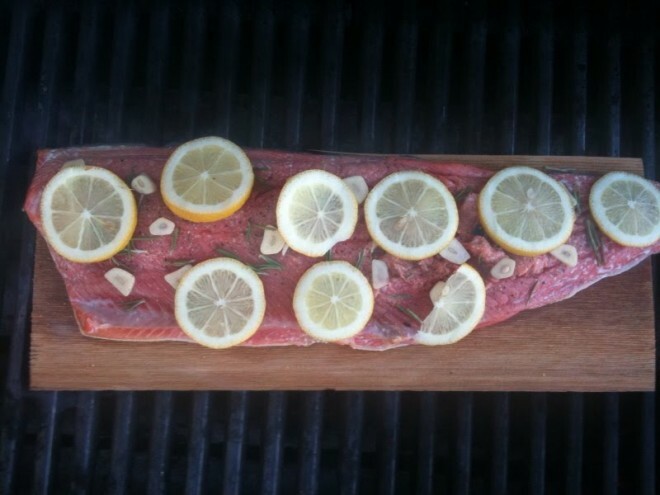 Cedar plank grilling - simple and delicious. Preheat your grill. Remove the plank from its soak and place the fillet on the plank. Sprinkle the fillet with spices and decorate with the rosemary sprigs and garlic slices, finishing with the lemon slices. Reduce your grill to cooking temp (400-425 deg) med-high and place the planked fish in the middle of your grill rack. Close the cover on the grill and let it cook for 15-20 minutes before you check it. Yes, it is supposed to smoke. (And if you’ve soaked and trimmed the plank, it should not catch on fire.) In the meantime, get to work on those veggies! Heat the coconut oil at med-high heat in a large skillet. Put the squash shreds in a strainer after you grate them and squeeze out as much moisture as you can before cooking. Add the garlic, onion and red pepper to the heated skillet and saute until soft. Add the squash shreds and spices and stir and cook at med-high heat until the liquid cooks off to your liking – about 15-20 minutes. After about 20 minutes, check the salmon. When it’s done, it should be opaque in the middle of the thickest part of the fish. Use a spatula to remove the meat from the skin (which is now fused to the cedar plank) and plate it with the lemon wedges and the squash shred medley. 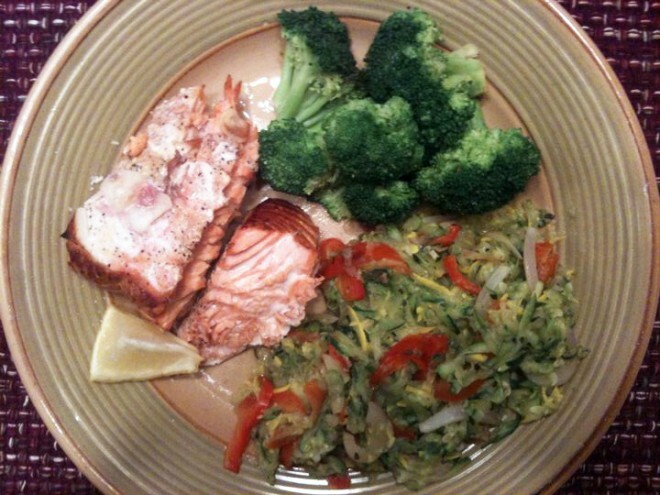 Steal This Meal - with a side of fresh broccoli for extra veggie goodness. One thing I’d add is that if I cook it this way, I find that the flavor of the cedar plank never seems to come through enough through the skin. I’ve found that by removing the skin and buttering the plank, far more cedar “flavor” (essence?) is imparted to salmon. I imagine any fat could be used to facilitate flavor transfer (like coconut oil). @MikeH: Good tip – and I bet coconut oil would add a gorgeous subtle flavor to the dish as well. Thanks for the note! Today woot.com is selling TrueFire Gourmet Cedar Grilling Plank 12-Pack & Cedar Wrap 24-Pack Bundle for $14.99. What wonderful timing for this post! I’ve never tried cooking with them, but am excited to. @Laura: Thanks for the tip! Sweet deal – let us know how your salmon comes out. Salmon with lemon sqeezed on the top, and lemon slices, and some green onions on the top. I used olive oil on the cedar, seems to transfer the taste to the salmon very well. Sides were asparagus, spinach salad with strawberries, and a few sliced/roasted sweet potatoes – excellent dinner. Oh – and, for fun, I put two tilapia fillets on the plank also – just to see what would happen. These fillets really took the cedar taste well – and firmed up well (unlike when I try to cook them on the stove, or in the oven). Whole 30 – day 16.